Birdsnest Autumn Capsule Wardrobe: for the busy stylish Mum! Are you guilty of having racks full of clothes and absolutely nothing to wear?! You are definitely not alone! If this sounds like you, then the concept of a capsule wardrobe is definitely going to be a game changer for every day dressing with ease. 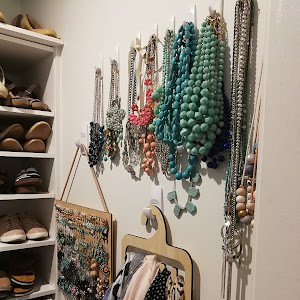 So what is a capsule wardrobe? In a nutshell it is a small number of clothes that all mix and match to create effortless (and stress free) dressing every day! The super clever ladies over at Birdsnest are the absolute 'queens' of the capsule wardrobe. 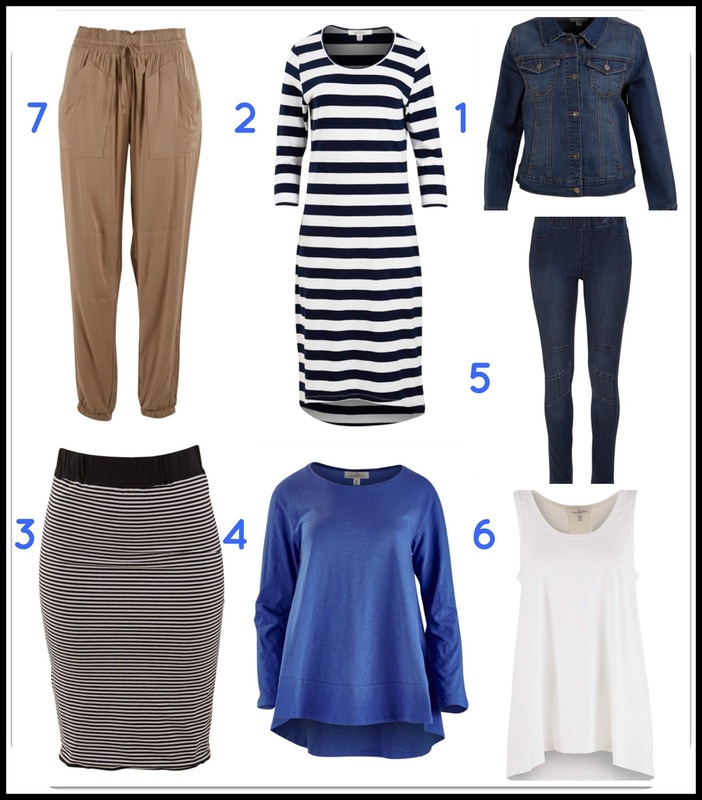 Over on their website you can view the perfect capsule wardrobe to suit your personal style, life stage, season and even special occassions such as vacations. For this look I have chosen to 'dress' this little number up with wedges and a necklace. But I have also been wearing this with tan ankle boots as the temperature has dropped here in Melbourne. 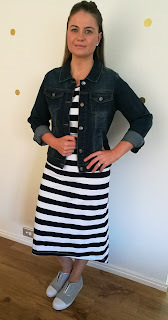 For my second look, I have chosen to show just how versatile this dress is by teaming it with a pair of slip on sneakers and the ultimate denim jacket for a more casual look. This amazing little dress is also available in grey, but I just adore love the crisp navy and white. You'll see me layering this dress with chunky knit cardigans in shades of soft grey and soft pink over the cooler Winter months. You can really tell I love stripes now can't you?! 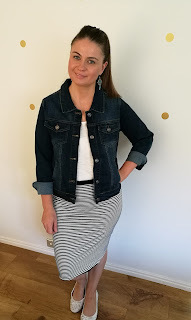 But seriously a stretch, stripe skirt is the perfect trans-seasonal piece. This skirt will work extra hard in your wardrobe as it is actually reversible. On the reverse side you'll find the perfect classic black skirt. For this look, I have added the Bird Keepers simple white tank . This tank is the perfect floaty design (with gorgeous pin tuck back) that you will truly have on repeat all year round! A simple pair of flats and a jacket dress this skirt down. Come winter you can add black tights, boots and a killer scarf to this look. The skirt is back! This time I have added the super flattering Bird Keepers long sleeve swing tee in the blue colour. This tee also comes in a total of 10 stunning colours, but I just adore this blue! Every woman deserves to look and feel great in denim and you'd be pretty hard pressed to find a more flattering pair of jeggings than these Boho Bird Wild West Stitched Jeggings. I think that the 250+ fabulous reviews on the Birdsnest page speak for themselves if you don't believe me! With their high elastic waist (a must for my mum tum), these will fast be your favourite wardrobe staple. I have gone for the 'denim' colour in these, but there are 3 other colour variations in this style. Because this style can be quite fitted, I love how the longer line of the swing tee works with these! 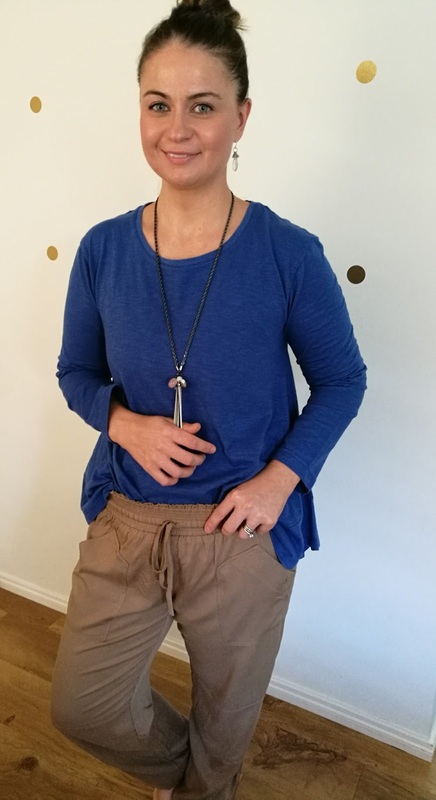 There is no truly limit to these jeggings - dress up with a gorgeous blouse and heels for date night or with a puffer vest and some trainers for weekends watching the kids play sport. Every busy Mum needs a pair of pants that feel as comfy as tracksuit pants, but look as great as these utility pants! With their comfy elastic waist and super soft material, you'll want these in the black colour too. The stunning neutral khaki colour will work with so many different coloured tops. These utility pants look great with the classic denim jacket and simple tank. When the wamer weather rolls around again, the simple tank and pant combo will be a winner! A HUGE thank you to the ladies at Birdsnest for allowing me to play dress up in your gorgeous clothes - I had so much fun! I have so many readers ask me for outfit ideas, so I hope that this post has helped you kickstart your capsule wardrobe for the cooler weather ahead. As always, if you have any questions on styles or sizing, please feel free to comment below or contact me direct.